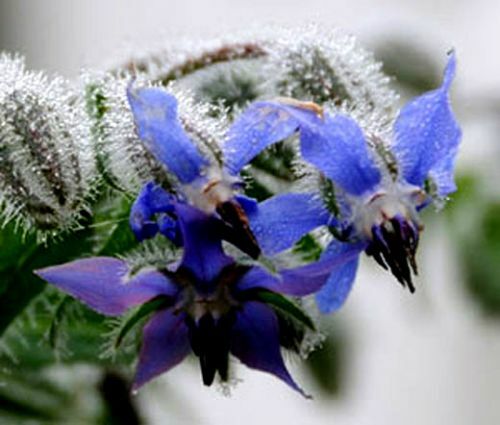 Borage Borago Officinalis is a hardy annual herb native to the Mediterranean region. Borage seeds are very easy to grow, and also called Starflower this herb plant features foliage with large, dark-green leaves and produces distinctive, blue-purplish, star-shaped flowers. One of the prettiest herbs to grow Borage blooms all summer long, and its fragrant flowers are known as one of the best for attracting bees, so that is why other common names of this flowering herb are Bee Plant and Bee Bread. Borage is grown as an unusual, two foot tall, annual herb for its ornamental value, and Borage is often planted in pots on a patio. Borago Officinalis seeds need some light to germinate, so the seeding depth has to be not more that 1/8 of inch. Borage prefers to grow in full sun or partial shade and average to rich, well-drained soil. Bee Plant self-sows itself freely and comes up year after year in the same place. The small new leaves and the star shaped purple-blue flowers of Borage are very popular for making hot and cold drinks, especially teas.